Happy New Year. 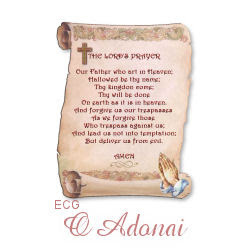 Hope you all have a very blessed and healthy New Year!! "...there is an opportunity for a plenary indulgence for those who partake in the traditional end-of-year public recitation of the Te Deum on December 31. The Canons at St. Francis de Sales will pray the Te Deum at 5 pm. It is a very convenient opportunity to gain the indulgence, which may come in quite handy the way people drive on New Year's Eve. The usual conditions apply-- confession, communion, prayers for the intentions of the Holy Father, complete detachment from sin..."
"At the very outset of Christ's work on earth, God showed the world a family in which, as Pope Leo XIII teaches, 'all men might behold a perfect model of domestic life, and of all virtue and holiness.' The harmony, unity, and holiness which characterized this holy Family make it the model for all Christian families." O Jesus, our most loving Redeemer, who having come to enlighten the world with Thy teaching and example, didst will to pass the greater part of Thy life in humility and subjection to Mary and Joseph in the poor home of Nazareth, thus sanctifying the Family that was to be an example for all Christian families, graciously receive our family as it dedicates and consecrates itself to Thee this day. Do Thou defend us, guard us, and establish amongst us Thy holy fear, true peace, and concord in Christian love; in order that, by conforming ourselves to the divine pattern of Thy family, we may be able, all of us, without exception, to attain to eternal happiness. Mary,d ear Mother of Jesus and Mother of us, by thy kindly intercession make this our humble offering acceptable in the sight of Jesus, and obtain for us His graces and blessings. O Saint Joseph, most holy guardian of Jesus and Mary, assist us by they prayers in all our spiritual and temporal necessities; that so we may be enable to praise our divine Savior Jesus, together with Mary and thee, for all eternity. O God, heavenly Father, it was part of Thine eternal decree that Thine only-begotten Son, Jesus Christ, the Savior of the human race, should form a holy family with Mary, His blessed mother, and His foster father, Saint Joesph. 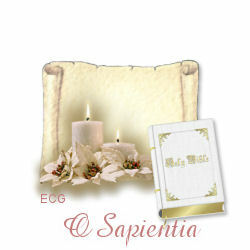 In Nazareth home life was sanctified, and a perfect example was given to ever Christian family. Grant, we beseech Thee, that we may fully comprehend and faithfully imitate the virtues of the Holy Family so that we may be united with them one day in their heavenly glory. Through the same Christ our Lord. Amen. 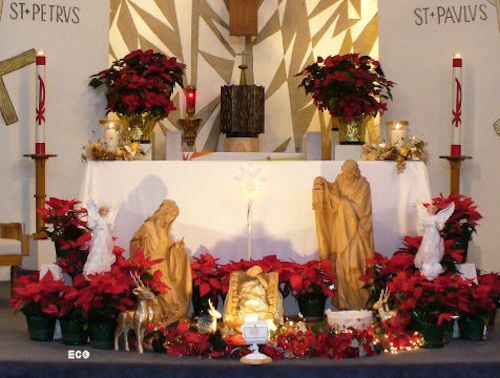 Tomorrow Dec. 30 - Memorial Mass - Servant of God, Fr. Hardon S.J. From downtown: I-30 going WEST, exit LOOP 12 SOUTH. Take the 2nd exit, which is JEFFERSON EAST. Go through the stop light & about 7-8 blocks. Someone one Twitter tweeted this fascinating story. Enjoy! Monsignor Paul J.E. Burkard, the man behind the cause for Father Nelson Baker's canonization, knows exactly where to search for good advice on navigating the Vatican's oftentimes perplexing saint-making process. He simply picks up the telephone and calls his sister in Syracuse, who already has helped guide the candidacy of Blessed Marianne Cope, a nun who ministered to lepers for more than 30 years, to the brink of canonization. "We talk about it frequently," Burkard said . Among the religious and cultural factors that influence converts to enter into full communion with the Church, the Blessed Virgin Mary holds particular prominence. Yet she is not the possession of the Catholic Church solely, for many Protestant churches are rediscovering the presence and role of Mary in life’s pilgrimage of faith. To believe in the ongoing prayer and care of Mary for the faithful is to find the Virgin Mother’s assistance in times of transitions, of new beginnings, of wandering and searching. Sacred Scripture shows us that Mary is the Virgin of beginnings and transitions (Annunciation, Cana, Pentecost), and the Virgin of spiritual searching (Presentation, Finding in the Temple, Cana, Calvary). It is quite natural then to experience her motherly presence in the struggles which accompany conversion, according to Father René Laurentin in A Year of Grace with Mary. Conversions to Catholicism develop from a complex of various factors. They result from conviction and personal experience. 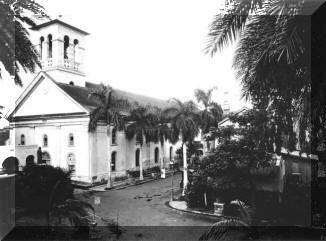 But also at play are conditions and developments in the Church and society that often help or hinder conversions. An instance of that scenario is nineteenth century England in which that period’s theological ferment and liberalism and the decision of the British government to suppress a number of Anglican bishoprics gave rise to the Oxford Movement, which questioned the Anglican Church’s legitimacy. The consequence was a number of conversions by prominent intellectuals from 1840-1920, the most noteworthy being John Henry Newman. These converts were usually imbued with an understanding of the Virgin Mary and their devotion to her often preceded their entry into the Catholic Church. As an Anglican, Newman thought that the Catholic Church’s Marian doctrine and devotion were exaggerated. But in his study of the development of doctrine, he discovered that it was consistent with the early church. “I was convinced by the Fathers,” he explained. The early Father and ancient Christian writers viewed Mary as the New Eve. Newman came to understand Mary in patristic terms. He understood the Immaculate Conception was based on Mary’s holiness, a concept present in the Fathers, and the Assumption was rooted in her dignity as Mother of God, another concept from the early Christian writers. Newman’s reluctance concerning the Virgin Mary, his “great crux” regarding Catholicism, were the “expressions of popular feelings toward the Blessed Virgin” and the intemperate statements of some Catholic authors concerning Mary. Later, when responding to Dr. Pusey’s Eirenicon, which contained numerous examples of exaggerated practices and devotions to Mary, Newman made a clear distinction between the Church’s doctrines and officially sanctioned prayers and practices, and the many expressions of popular devotions, sometimes questionable in taste and in theology. “Belief is separate from devotion; belief is the same everywhere, whereas expressions of devotion differ from place to place.” Newman also noted that cultural differences become manifest in expressions of devotion, indicating that there exists a legitimate “English style” in the expression of devotion. These distinctions between officially approved doctrine and devotion, and the many practices of popular devotion, which frequently reflect a cultural bias, have helped many along the journey of conversion. Such was the experience of this famous convert and devotee of the Mother of the Redeemer. 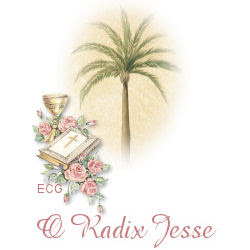 A Spiritual Aeneid, ranks with Newman’s Apologia as a classic and impressive conversion story. His interest in Mary stems from his fascination with English heritage and his attraction to Anglo-Catholicism. 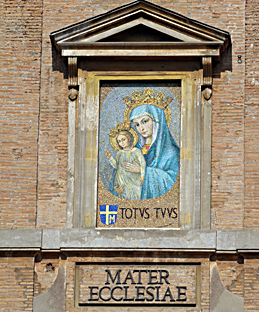 Among his earliest remembrances of the Blessed Virgin were his image on his school’s coat of arms and the prayers used in the chapel services. When a youngster he turned into a poem for Mary the blasphemous lines of Algernon Swinburne’s poem to the pagan queen of death. “But I turn to her still, having seen she shall surely abide in the end. A poem of his youth, The Nativity of Botticelli, attests, to his understanding or Mary’s role in the Incarnation. His early writings, such as Orthodoxy (1908) and Ballad of the White Horse (1911), led others to anticipate his entry into the Catholic Church in 1922. This final step was the result of a promise made at a Marian shrine in Italy. Chesterton wrote in 1934 that Mary represented the “collective unity of Catholic life” about which Protestants had such strange notions. One of GKC’s poems in The Queen of Seven Swords expressed his notion of the “wholeness” which underlies all expressions of devotion. This is the legacy of several prominent British converts to the ongoing Marian movement. From here we look at the witness of two American converts of our times. Although baptized an Episcopalian, Dorothy Day might be characterized as an evangelical Protestant because of her involvement in the “social gospel” movement. She was a talented journalist who espoused radical causes, wrote for socialist newspapers, and staunch in her support of labor unions and pacificism. Her earliest contacts with Mary came from a rosary and a small statue. While anticipating the birth of her daughter through a common law marriage, Dorothy Day began taking instructions so that her daughter could be baptized in the Catholic Church. “I began to think, to weigh things,” she explained, “and it was at this moment that I began consciously to pray more.” She developed the habits of praying often, of carrying a rosary, and addressing the statue of the Blessed Virgin Mary which had been given her. For Dorothy Day, Mary and Joseph shared in the plight and insecurity of the poor. During the Great Depression she wrote, “What security did the Blessed Virgin herself have as she fled in the night with the Baby in her arms to go into a strange country? She probably wondered whether St. Joseph would be able to obtain work in a foreign land, how they would get along, and anticipated the loneliness of being without friends, her cousin, St. Elizabeth, her kinfolk.” At another time she recalled, “St. Bonaventure says Our Lady worked in Egypt to earn the family’s daily bread because St. Joseph could not earn enough. It was all part of the humiliation of poverty for St. Joseph.” She realized that the Holy Family definitely shared the lot of the poor. The conversion of Thomas Merton led to a prolific writing apostolate and was widely followed and celebrated. His parents were artists with little religious interest. Educated in France and England, his interest in religious questions grew out of his study of literature and philosophy. In 1938 he entered the Catholic Church, and later became a Trappist monk at the Gethsemane Abbey in Kentucky. His talented pen produced voluminous writings in a personal style on topics pertaining to monastic spirituality, mysticism, racial justice, and peace. Merton’s references to the Virgin Mary are personal and deep, a response to a mystical attraction. The Seven Storey Mountain is the autobiographical account of his early life and conversion. One passage concerns his departure from England to a new life in New York City. He describes his experience of Mary’s guidance at this turning point in his life in these striking words. At crucial points in his life he actively sought the presence of Mary and her direction. When discerning his vocation to the priesthood he embarked on a pilgrimage to the shrine of Our Lady of Charity of Cobre in Cuba. For Thomas Merton, Mary is always persuading from within. “Mary does not rule us from without, but from within. She does not change us by changing the world around us, but she changes the world around us by first changing our own inner lives.” Thus was Merton’s journey of faith with Mary. This attached article about Mary and converts was originally published in Ephemerides Mariologicae, a polyglot Mariological journal, July-December 2011. 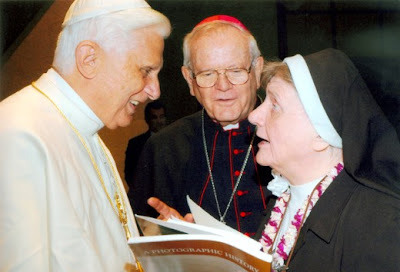 I was saddened to learn of the passing of Sister Mary Laurence Hanley. Just the other day on one of the blog posts, I recommended her book on Bl. Mother Marianne Cope, A Song of Pilgrimage and Exile. Hawaii Catholic Herald's Sister Mary Laurence Hanley dies. I had the privilege of having an email communication with Sister a few years back. If I remember correctly, she contacted me about a blog post she disagreed with. I dared to mention that Brother Joseph Dutton may one day follow in the saintly footsteps of Saint Damien and Bl. Mother Marianne Cope. This was certainly something Sister really disagreed about. She was very pleasant and friendly in all her emails back and forth. But she maintained her position that Brother Dutton not be a candidate for sainthood. She had her reasons. She was often told me to do my own research with all the archival materials at my disposal in Hawaii. She indicated that I would then draw the same conclusion. Unfortunately, I never got around to doing that research and little by little we stopped emailing. Even though we, the Church Militant, may be sad that she did not live to see her hero canonized. I doubt very much Sister is disappointed. After all, she will probably be there to congratulate Mother Marianne Cope in person! The Church celebrates the feast of Saint Juan Diego on December 9. The canonization of Saint Juan Diego by Pope John Paul II in 2002 elicited worldwide enthusiasm for the recognition of another Christlike lay person. 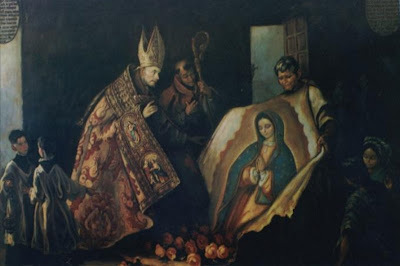 This latest saint of Mexico was the Virgin Mother Mary's chosen messenger of evangelization in the nascent Church of the l6th century New World. He is an illustrious example of a Christian in action. The contemporary significance of the canonization and the occurrence at Guadalupe is multifaceted. But the implication for the new evangelization in our day is overwhelming. The honor bestowed on Saint Juan Diego extends the clarion call addressed to all Christians to respond actively to their baptismal vocation and consecration to collaborate with Mary in bringing Christ to all peoples. Echoed again is the slogan of Blessed William Joseph Chaminade, Founder of the Marianist Family, "We are all missionaries of Mary." The occasion has renewed and increased the momentum of the movement to designate Juan Diego as the patron saint of the laity and lay apostles. God's plan for salvation needs the cooperation of us all. In the Guadalupe event, God chose to give the miraculous image of Mary, his Mother and ours, to a humble, lonely widower. The engaging, simple story of Our Lady giving her picture to Juan Diego touches hearts and disposes them for the grace of baptism. This is a special chapter in the evangelization of the world. Today we find stirrings of new interest in the unchurched, the alienated, and the disenchanted. Faster travel and easier global communication portend a new fullness of time in spreading the gospel. 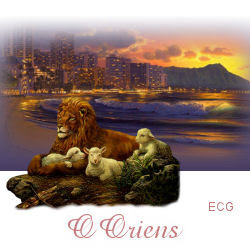 Since the beginning, God has depended on his creatures to fulfill his plan. Today there is a desire for unity among Christians. The work of the Holy Spirit is uniting them in prayer, love, and works of charity. In the past century Pope Pius XI and Pope Pius XII began to re-emphasize the importance of the role of the laity. Long before Pope John XXIII convened the Second Vatican Council to renew all in Christ, the lay apostolate was a point of emphasis and concern. One of the sixteen documents of Vatican II is the Decree on the Laity (Apostolicam Actuositatem, 1965), and the role of the laity is treated in several of the other documents. Some years later Pope Paul VI sounded a prophetic call to evangelization with the apostolic exhortation On Evangelization in the Modern World (Evangelii Nuntiandi, 1975). 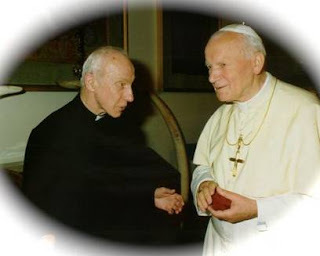 Our present pontiff, John Paul II, has preached a new evangelization and, following a Synod of Bishops, issued an apostolic exhortation on Lay Members of Christ's Faithful People (Christifideles Laici, 1989). 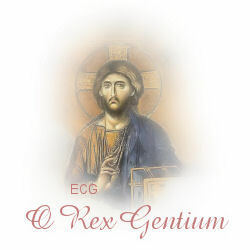 Pope Benedict XVI has renewed this call to action, and the Synod of bishops in 2012 will ponder this new evangelization. The Handmaid of the Lord, the Spouse of the Holy Spirit, who first brought forth the Savior for us, plays her part in bringing his Good News to all. The nineteenth-century apostle of Mary, Blessed William Joseph Chaminade, is among the strongest voices still reminding us of our baptismal obligation to participate in the apostolic mission of Mary to complete the Whole Christ. 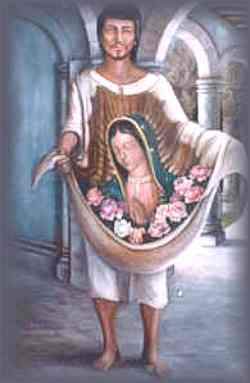 Like Juan Diego, all the faithful are called to spread the fragrance of the roses of Tepeyac wherever we are, whatever we do. "Thy kingdom come," the daily petition of the Our Father, has always needed for its fulfillment the work and collaboration of the laity. To all Christians is given the commission to make Christ and his teaching known, loved, and lived. "The Spirit breathes where he wills" (Jn 3:8), and the people of God have always had the charisms to help spread God's kingdom on earth. Our times need strong and dedicated Christian lay persons more than ever before. All fields of human progress are directed by the laity. Competence in the social, commercial, and political spheres is in the hands of the laity. Only they can bring the spirit of the gospel into these arenas. In the words of Paul VI, lay persons are "the bridge to the modern world." Recognizing the ancient truth and the new need, Vatican II issued an official decree on the apostolate of the laity. For the first time in the history of the Church a conciliar document expounded the concept that the lay person is indispensable to the mission of the Church, that to be a real Christian is to be an apostle. The Vatican II Decree on the Laity advances, as the perfect example of the spiritual and apostolic life, the Virgin Mary, Queen of Apostles. "While leading on earth a life common to all, one filled with family concerns and labors, she was always intimately united with her Son and cooperated in the work of the Savior in a manner altogether special. Now that she has been taken up into heaven, with her maternal charity she cares for the brothers and sisters of her Son" (n. 4). Consequently, it is appropriate that the model for the laity and the patron of the lay apostolate be one who will lead others to Mary, who in turn will lead them to Christ. She is the perfect example of life on earth united to Christ and joined to his work. To choose Juan Diego would stress the motherly concern of Mary, and highlight a special chapter in the loving care of the Queen of Apostles for her children. Juan Diego's life story exemplifies the meaning of the lay apostolate. He leads with singular and irresistible charm to our spiritual mother. Juan Diego's story continues today as something living and enduring. It lives in the long lines of pilgrims, the most numerous of any shrine. 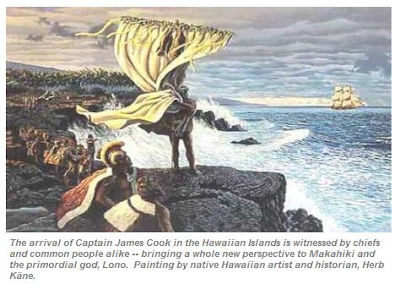 It lives in the faith of a whole nation, and is celebrated in the entire western hemisphere. It captivates the hearts of all. It endures in the continuing portrait not painted by human hands, but as Pius XII explained, "by brushes not of this world." Vatican II taught that "union with those whom the Holy Spirit has assigned to God's Church is an essential element of the Christian apostolate." Juan Diego received the charism. He was called by Mary. She sent him to the bishop: "Go to the Bishop of Mexico and tell him that I sent you." The Spirit breathed on Juan, but judgment and command were reserved to the bishop, as it still is today. The Holy Spirit usually breathes in less dramatic ways. But, the experience of Juan Diego shows that the inspirational grace for a great work may first come to a lay person, and that the chosen person then cooperates with the competent authorities. Juan Diego's humble compliance with an unwelcome and embarrassing mission paved the way for an abundant bestowal of God's blessings. In addition, the event clearly indicates that a layman pushed his point with a hierarch. The bishop needed convincing, and Mary told Juan to go back and try again. Mary clearly indicated to Juan Diego that he was necessary for the execution of heaven's plan. 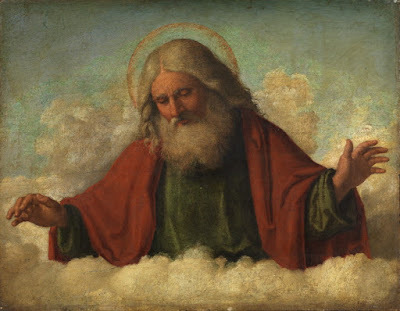 When he protested his inability and urged the Virgin Mary to send a person better known and respected, her answer was: "Listen, least of my sons. You must try to understand that I have many messengers and servants whom I could charge with the delivery of my message and cause to do my will. But, it is altogether necessary that you, yourself should undertake this entreaty and that through your own mediation and assistance, my purpose should be accomplished." The importance of the most humble person carrying out the divine plan can hardly be more sharply exemplified. Mary did not go directly to Bishop-elect Juan Zumarraga and inspire him. Nor did she choose the messenger most suited according to the judgment of human standards. Mary chose one particular, unknown, middle-aged widower who would have preferred to be left alone. She told him that he was to be the instrument of Divine Providence for these poor people. This unlikely layman was the key to "unlocking graces destined for a nation", and later for many nations. Juan Diego was wholehearted and without guile. He was a living example of sincerity arid simplicity. 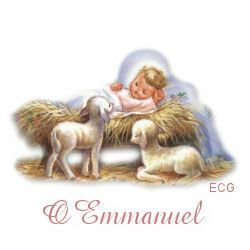 When children and adults hear about him they are fascinated, and love to hear the story retold. His conversations with Mary have a rare quality of tenderness, immediacy, genuineness, and uniqueness. Translated into any language they possess a special appeal. In the Aztec Indian idiom, Mary called Juan her xocoyte, her favorite son, the least of her sons. He addressed her as xocoyata, his littlest daughter, his lady, and his child. Hearing this conversation one cannot help loving both Juan and his Lady. Peoples of the emerging nations are able to identify very easily with Juan Diego. He was humble and poor, not enmeshed in political or cultural history. With improved and increased communication, we can expect the Church will proclaim its primary message more widely and wisely. 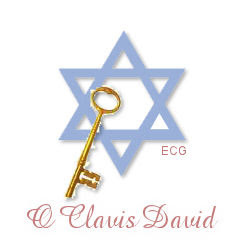 And lay persons will be the primary field workers. Juan Diego, who has universal appeal, would be an inspiration for them and an example for those with whom they work. His life story is a perfect example of how God's plans often require lay apostles, and how far-reaching the results can be. Our Blessed Mother promised, "I will make you worthy of the trouble you have taken." Juan Diego remained faithful until death. The results of his work remain with us. He was childlike and humble in his relationship with the natural world and the supernatural order. While very ordinary and natural, he felt at home with the Virgin Mother Mary. His simple and human qualities touch us all. Saint Juan Diego is genuinely worthy to be patron of lay apostles, for he was the only person on earth to whom the greatest laywoman of all time gave her own picture. A movement was launched more than a decade ago under the auspices of the Archdiocese of Mexico City to nominate Juan Diego as patron of lay apostles. His canonization lends new impetus to the momentum already in progress. The actual result of Our Lady of Guadalupe's message, in which Saint Juan Diego played the key role, brought belief in Jesus Christ and the grace of baptism to countless native Indians of Aztec heritage. In the seven years following Mary's appearance at Tepeyac (1532-1538), eight million Indians were baptized into Christ. During that period Saint Juan Diego lived near the marvelous picture, quietly caring for it as Saint Joseph cared for Mary herself. He is a major part of the story of the magnificent lady, her representative, a living proof that heaven had smiled on the poor and the lowly. As with Saint Joseph, we do not know all the details. But we do know the quality of this layman's charity was magnetic. "By this will all know that you are my disciples, if you have love for one another" (Jn 13:35). He was, according to his Aztec name, Mary's "singing eagle," telling her story over and over to his fellow countrymen. The sterling example of Saint Juan Diego inspires us to activate the continuing action of baptismal grace to be the "salt of the earth," "the light on the lampstand," the "leaven in the mass," and to “proclaim the Good News by word and deed." In the early months of the liturgical year we honor two special vocations in God’s plan of salvation -- the immaculately conceived Virgin Mary and one of her special proteges, Bernadette Soubirous. The solemnity of Mary’s Immaculate Conception is celebrated on December 8, and honors the conception of Mary in the womb of her mother, St. Anne, without original sin. February 11 is the feast of Our Lady of Lourdes, the date of the first appearance of Our Lady to Bernadette. April 16 is the feast day of St. Bernadette. In 2008 we celebrated the 150th anniversary of the Blessed Virgin’s apparitions at Lourdes, where she identified herself to St. Bernadette as the Immaculate Conception. In 2004 we observed the 150th anniversary of Blessed Pope Pius IX’s solemn definition of this dogma on December 8, 1854. 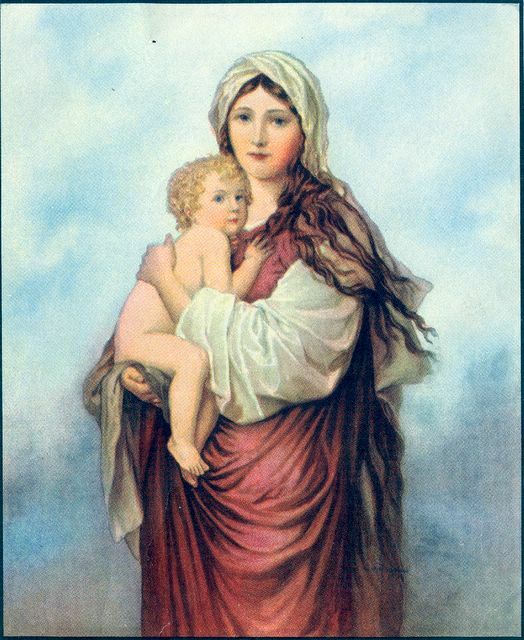 Blessed Pius IX explained that Mary was preserved from original sin by a “singular grace and privilege” given her by God “in view of the merits of Jesus Christ, “Redeemer of the human race. Mary, like every other human being, needed the redemptive benefits of Christ. But in anticipation of what God did for all through Christ, she alone was preserved from original sin “from the first moment of her conception.” As one writer asserted, hers was a “redemption by exemption.” By her Immaculate Conception she was conceived in the fullness of grace, in the state of closest possible union with God in view of her future role as the Mother of the Redeemer. The feast of the Immaculate Conception of Mary was celebrated already in the seventh century in Palestine as the Conception by St. Anne of the Theotokos (Mother of God) on December 9. The doctrine is understood differently by some Eastern Christian Churches because of a variance in their theological understanding of original sin. The observance spread west from Constantinople. Still called the Conception of St. Anne and observed on December 8, it was prominent in Naples in the ninth century; in English monasteries in the eleventh century, when it was called the feast of the conception of Our Lady; and in France in the twelfth century. When the feast was introduced in France, St. Bernard of Clairvaux opposed it, igniting a controversy that endured for three centuries. Most Scholastic theologians, including St. Anselm of Canterbury, St. Albert the Great, St. Thomas Aquinas, and St. Bonaventure opposed the doctrine on the grounds that it detracted from the universality of the redemption by Christ. But it was defended and explained with theological clarity in the thirteenth century by Blessed John Duns Scotus, a Franciscan. In 1263 the Franciscans adopted the feast. The Council of Basel in 1439 affirmed this belief. Ten years later the Sorbonne in Paris required all its degree candidates to pledge an oath to defend the Immaculate Conception of Mary. Pope Sixtus IV in 1476 approved the feast with its proper Mass and Office, and in 1708 Pope Clement IX extended the feast to the universal Church and made it a holyday of obligation. Later the Council of Trent (1545-1563) explicitly declared that Mary was exempt from the taint of original sin. From then on the belief was embraced generally and defended by all schools of theology. 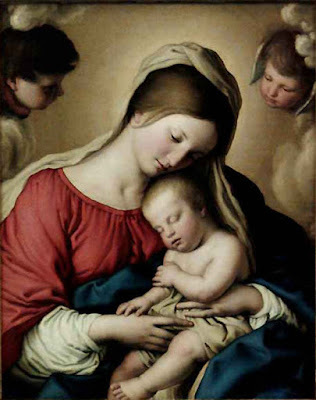 Many Catholic thinkers and founders of the eighteenth and nineteenth centuries promoted and expounded Mary’s Immaculate Conception with special interest and verve, and this doctrine became an important part of many Marian spiritualities. One such exponent was Blessed William Joseph Chaminade (1761-1850), founder of the Marianist Family. 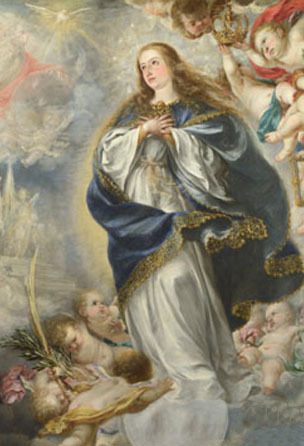 Conception of Mary by the Church of England. Among the Eastern Christian Churches the feast of the Conception by St. Anne of the Most Holy Theotokos continues to be observed on December 9. The date set for the feast is nine months before the Birth of Mary on September 8. To celebrate the centenary of the definition of Mary’s Immaculate Conception, Pope Pius XII, a devout apostle of Mary, declared 1954 a Marian Year -- the first. Now, more than150 years later, we were privileged to mark the sesquicentennial of that solemn definition and its recognition by Mary Immaculate at Lourdes.